The stained glass window that hangs in the gallery between the Sanctuary and the Social Hall has special meaning. It was created by the seventh grade Religious School class during the 1976-1977 school year as a way of turning violence into beauty. The centerpiece of the sail is made from a piece of glass from a Temple foyer window that was broken by vandals that year. Under the direction of Cantor Jerome E. Krasnow, the students learned to work in stained glass, and each student contributed a piece to the final work. The final product is a sailing ship, the symbol of the tribe of Zebulin, the tribe of Israel charged by Jacob to provide a safe haven for ships at sea (Genesis 49:13). 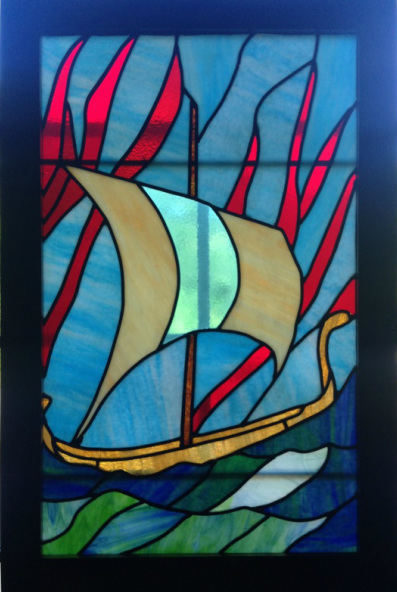 The stained glass Zebulin is meant to symbolize the Jewish people navigating through troubled waters and remaining afloat during their turbulent history. In 1977, the seventh grade students dedicated their Zebulin to freedom-seeking Soviet Jews and, in particular, to Anatoly Scharansky. Scharansky was then the founder of the Refusenik movement in the Soviet Union – Jews who had been refused permission to emigrate to Israel. In 1977, Scharansky had recently had been arrested on charges of spying and treason by there Soviet Union and had been sentenced to forced labor in Siberia. An intense international campaign finally pressured the Soviet Union to release Scharansky in 1986. Immediately after his release, Scharansky immigrated to Israel and changed his name to Natan Sharansky. He served as a member of the Israeli Knesset from 1996 to 2006. He has served Israel as Minister of Housing and Construction, Minister of the Interior, and Minister of Industry and Trade. Today he is the chairman of the executive of the Jewish Agency for Israel. Sharansky's story since 1977 is an echo of the intentions of the seventh graders who that year created this work of art – to turn despair into triumph. It is also the story of the Jewish people that we remember every Passover when we say, "Our story begins with degradation and ends in dignity."